After my fourth year attending the 6th Annual Los Angeles Luxury Chocolate Salon held this year in the Civic Auditorium in Santa Monica, CA, I’ve learned a few things to maximize the tasting experience. Read this and you’ll benefit too. I took the above photo in a chocolate maker’s workshop. 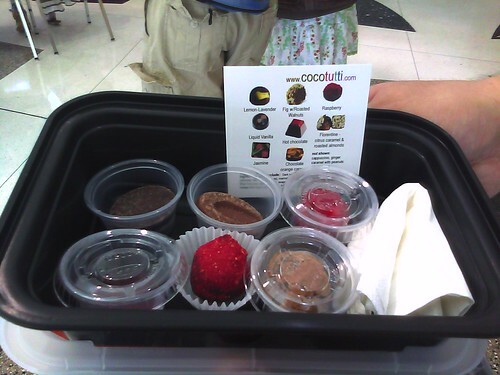 The container shows most of the elements that make up a delicious raspberry truffle. By tasting each ingredient separately I, as the taster, learned to appreciate all the nuances in the truffle and can now enjoy this and other truffles on a deeper level. The complete truffle is the red item in the bottom row, center. By following tip #4 I didn’t get as fatigued of eating chocolate by the end because with a container in hand from the aforementioned workshop I was able to consume the most interesting samples first, asking myself whether I would regret NOT trying a sample. If yes I’d eat it immediately and if no I’d save it in the box for later. That made a world of difference! If you get the chance to sample fine chocolates with unique flavors (lavender chocolate!) and in various forms– including toffee, caramel and things that pair well with chocolate– take it! My fun day also included a short walk over to the Santa Monica Pier and Santa Monica Place (outdoor mall with food court). View the Flickr page from Oct. 6th for a few more photos and let me know how your next chocolate tasting experience goes. This entry was posted on Sunday, October 7th, 2012 at 8:39 pm	and tagged with chocolate, gourmet chocolate, la chocolate salon, santa monica, santa monica pier and posted in Uncategorized. You can follow any responses to this entry through the RSS 2.0 feed.